There is growing interest in local food systems, but is local enough? Contextualizing "local" within a regional food system approach may enable us to make smarter decisions about transportation and infrastructure support, as well as the management of water and other natural resources. Kate Clancy will review some of the arguments in favor of regional approaches to food systems development and policy efforts. She will offer examples from the Enhancing Food Security in the Northeast regional food systems/food security project, and engage webinar attendees in a discussion of how they have expanded their regional ties in the past year and how they might do more through the Chesapeake Foodshed Network and other institutions, followed by a question and answer period. 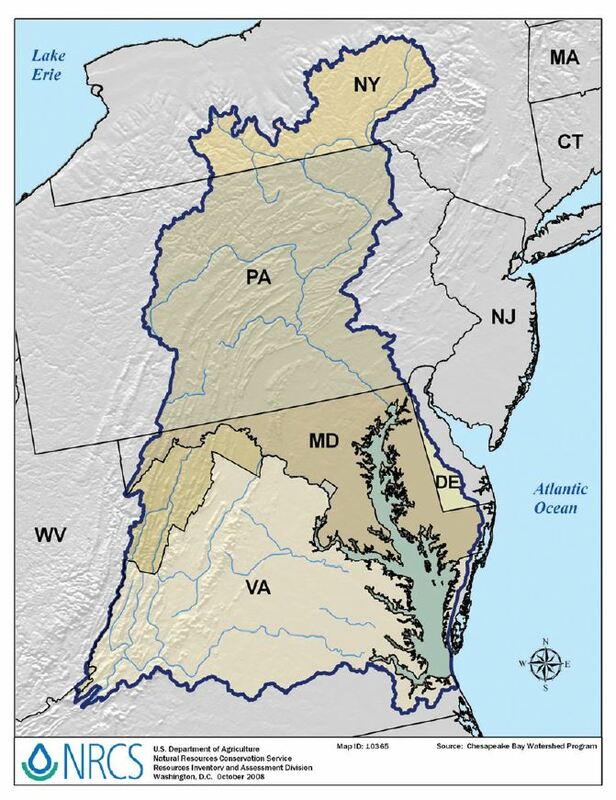 The Chesapeake Foodshed Network covers the entire Chesapeake Bay watershed (pictured left) - underscoring the importance of agriculture on water quality. What are the Coffee Talks? The Chesapeake Foodshed Network's Coffee Talks are a monthly webinar series on a variety of food system topics. These short programs serve as a starting point for collective action by providing education on a specific issue, and by encouraging continuing engagement for participants doing similar or complimentary work in the food system. We invite food system resource experts to use the Coffee Talk platform to engage with a broader audience. Contact us at chesapeakefoodshednetwork [at] gmail [dot] com if you would like to lead a Coffee Talk. Kate Clancy is currently a food systems consultant, Visiting Scholar at the Center for a Livable Future Johns Hopkins University School of Public Health, Adjunct Professor at Tufts University, and Senior Fellow in the Minnesota Institute for Sustainable Agriculture, University of Minnesota. She worked as a nutrition and policy advisor at the Federal Trade Commission, and at several nonprofits such as the Wallace Center. Clancy developed a graduate course on food systems in 1982 and since then has published, taught, spoken, and consulted widely on sustainable agriculture, food systems, and food policy with government agencies, universities, and nonprofits around the country. She is the deputy director of the USDA-funded five-year EFSNE systems project in the Northeast United States, and engaged with many initiatives including Agriculture in the Middle and It Takes a Region. She was a member of the Institute of Medicine committee that a year ago published a framework to assess the health, environmental, social, and economic effects of the US food system. The Chesapeake Foodshed Network works to catalyze connections and collaborations that build a sustainable, resilient, inclusive and equitable food system in the Chesapeake Bay watershed.